If you want to receive replies to your SMS campaigns or if you want to easily expand your contact database, having an inbound text number or short code is the perfect solution. Generate responses with a keyword on a short code number; our short code number is 88440. Having a keyword on a short code number will increase your response rate, it's easy to remember and a great tool for advertising and promotions. We can dedicate one of our virtual mobile numbers to you. A virtual mobile number is just like a normal UK mobile number but is unable to accept calls. Therefore if you set this as the sender ID, your customer will merely need to hit the reply button rather than bothering with keywords/typing in a different reply number. You can manage your replies using your inbox. You can set up as many individual keywords on your dedicated VMN. 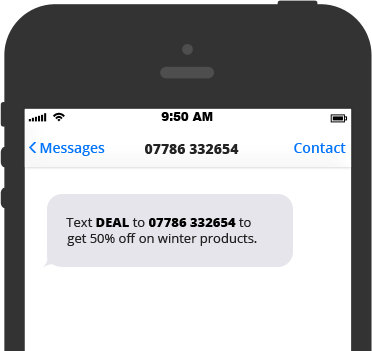 We can set up a keyword on one of our shared virtual mobile numbers so your recipients can reply with this and the messages will be forwarded to your account on the portal. For example you could have in the message body, “to reply text EXAMPLE to 07xxxxxxxxx”. With this, your recipients would need to make sure that they have started the message with the keyword “EXAMPLE” or the portal will not filter the message to your account. This will cost your recipient one standard network rate or be part of their inclusive bundle if they have any. 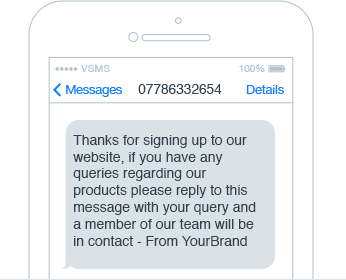 Exactly the same as a keyword on a VMN, customers will need to text the keyword and their reply to the short code. This will always charge one standard network rate to your customer/client regardless of inclusive minutes. The positives for the short code are that it looks professional, is memorable and will also use less characters in the body of the message, therefore keeping costs down. All inbound SMS will be available to view in your inbox on the portal as well as being downloadable via CSV and can even be forwarded to you via email or SMS. Forward the inbound SMS via email to the relevant person or department. Send an auto-response to the contact that sent you a message. Forward the received message to another number. Forward the message received to a contact list. Add the sender to a contact list. Add the sender to the blacklist. Call your own API to integrate inbound messaging with your own application. Use your VMN to have a two-way conversation in the Chat SMS module.